I am often considered to be “that lady who takes her dog everywhere” in some circles, and nothing could make me more proud. Having pet friendly holiday traditions is something we look forward to in our family every year. Holiday traditions are meant for the whole family to enjoy, and that family includes your pets, right? As we approach the Thanksgiving holiday with all of its trimmings, do you have a timely blog post planned for your readers? “I want to help but I just don’t know where to start. So many animals need homes.” How often do you hear or see that on social media or IRL (in real life)?! There are things your readers can do. Teach them and better yet, show them. One person can and does make a difference. Talk about cyber fostering a pet, giving to a favorite charity with food or monetary donations, getting involved with a favorite blog who is hosting a shelter drive, etc. Make an actionable list for your readers. Surviving the holiday season after pet loss is indescribable. I know this because I am a member of this group. That first holiday season after a pet dies is very, very raw and emotional, and chances are someone reading your blog feels the same way. If you are grieving a pet, there are things you can do during this holiday season (and year round) to bring a sense of peace to your life. Write a post about the ways to honor a pet who has crossed to the Rainbow Bridge. Provide readers with ways to memorialize their pet no matter how long ago that pet passed on. In true time-honored tradition, NBC will present the popular holiday special, “The National Dog Show Presented by Purina®” on Thanksgiving Day (noon-2 p.m. in all time zones), Nov. 23, following the telecast of NBC’s “Macy’s Thanksgiving Day Parade. Yours truly represented BlogPaws during an exclusive in-person interview with Mr. David Frei, who co-hosts the annual event with John O’Hurley. You are welcome to embed the video in a blog post about pet friendly things to do on Thanksgiving Day. 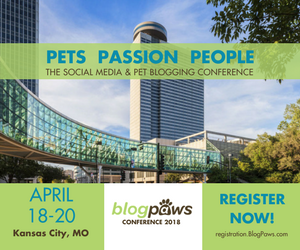 You may recall David Frei as emcee of a BlogPaws Conference and now he makes a grand return to the community who embraces him with open arms and paws. New York Magazine once called David Frei “probably the most famous human in the world of canines.” He is well-known to millions of television viewers as the “Voice of the Westminster Kennel Club” as co-host of USA Network’s annual telecast of the world’s most famous dog show for the past 26 years (since 1990) and as co-host on NBC of The National Dog Show presented by Purina on Thanksgiving Day since its inception in 2002. A re-airing of the broadcast takes place on Saturday night, November 25th. Check local listings. Move over Black Friday, start a new tradition involving your pets. This will take some pre-planning, but perhaps you and a group of your pet-loving friends can come together at a different house each year and spread the cheer, get the pets together, and enjoy some indoor Thanksgiving fun. Show your readers some ideas for pet games and even better, how to be a good canine or feline guest at someone else’s house. As you peruse the online sales for Black Friday, Small Business Saturday, and Cyber Monday, don’t forget the pets. Write a blog post about pet-friendly businesses. Did you know there are a bevy of malls across America that allows dogs (and other well-behaved pets, so call ahead) in many of their stores? Indeed. What yours truly did is plan ahead, found out when Santa was going to have pet-photo night and then did a “three-fer”: We visited the mall, walked in and out of stores together, had Santa photos taken, and then had a wonderful evening driving through lights in the Allentown, Pennsylvania area for Lights in the Parkway. Are you a blogger who likes to do DIY posts? For those who aren’t out shopping or are trying to escape family squabbles, the Internet is the best place to find pet-friendly projects. Do a Facebook Live and show your followers how to make something and then embed that Facebook Live video into a blog post for more traffic. Wait, there’s more: Include Amazon affiliate links in that blog post to drive traffic to the items needed. This time of year, folks head over to Amazon for small purchases but are likely to buy more things as gifts. It’s a win-win! Millions of people and pets are alone this time of year. For those in your area who may not have anyone stopping by, why not take your well-behaved pet to visit? Sometimes visiting a local shelter and asking if you can volunteer is a great way to beat the doldrums. Why keep this idea to yourself? 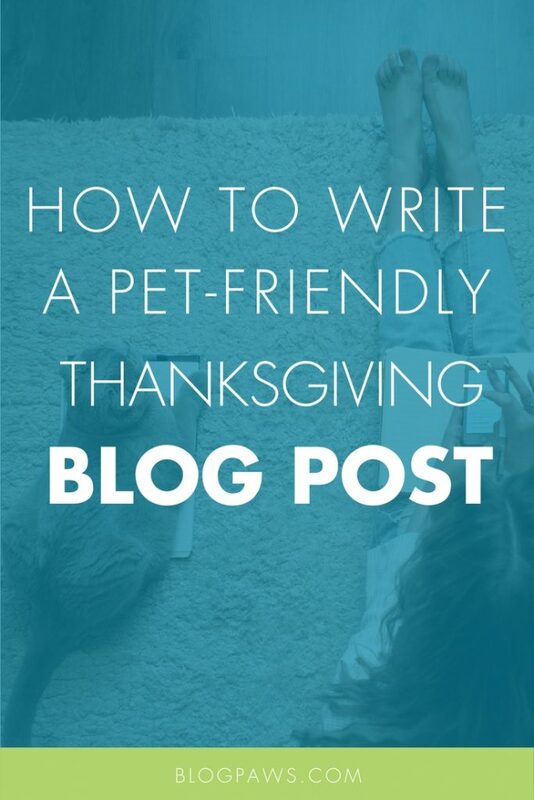 Write a blog post of ways to pay and paw it forward during the holiday season. People are shopping now and they will continue shopping in the days and weeks after Christmas to use gift cards they receive as presents. Gift Guides done right are a great way to connect with your readers to help determine content for the coming year. Gift Guides do not have to be products or services; they can be a list of outstanding charities that make an impact. Scroll back through the #BlogPawsChat hashtag from our 11/14/17 chat and learn more about gift guides and how to make them shine. It’s your turn. What are you doing with your pets this holiday season? 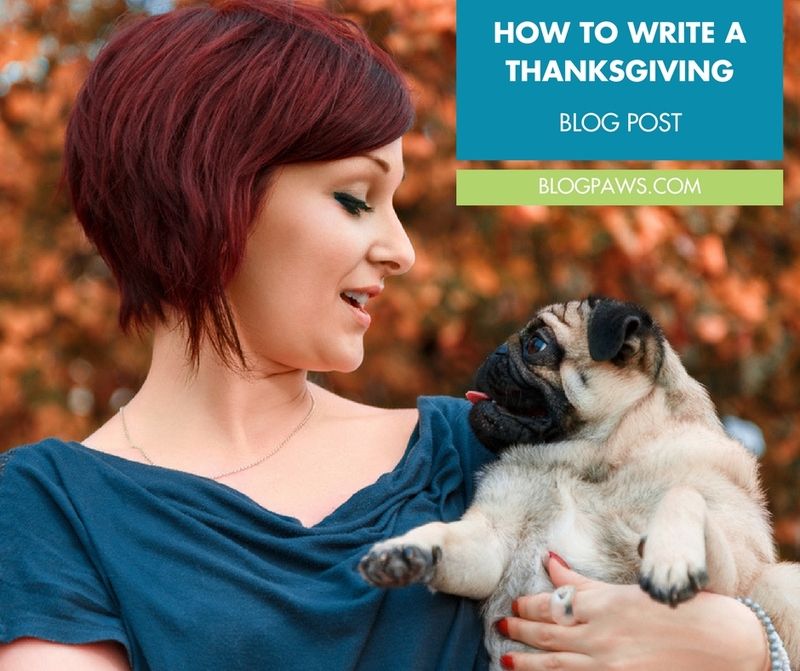 Are you planning any Thanksgiving weekend blog posts? Let us know in the comments below.